Wave Properties Computer Lab Activity (These activities must be done before any labs are done). 1. Click this link. Answer each question on the form. When completed hit the submit button at the bottom of the page. Click on the link below. Watch the clip. 1. Copy into notebook: "Wave--rhythmic disturbance that carries energy but not matter" Write a paragraph (minimum of 5 sentences) about the clip. 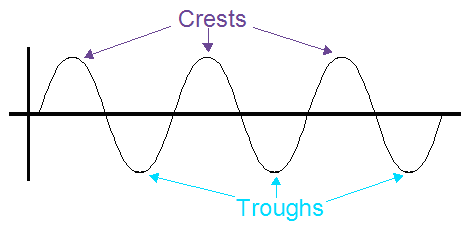 - Click on the crests& troughs picture and define crest and trough. - Use what you see to write your own definition of frequency. - Use what you see to write your own definition of amplitude. - Use what you see to write your own definition of wavelength. - There are 2 main types of waves: transverse, and compressional (a.k.a. longitudinal). Go to the wave motion page, and watch the animations of compressional and transverse waves.Using a complete sentence, list one thing that is similar between compressional (a.k.a. longitudinal) and transverse waves. Go the the earthquake wave website, and play the animations.